SlopeTracker inventor Jay Casper first became fascinated with GPS technology when he was a Naval aviator. Since leaving the service, he has combined his two passions, cutting-edge technology and skiing, to develop the best, most exciting, easiest tool available for tracking detailed statistics of every second you’re on a mountain. 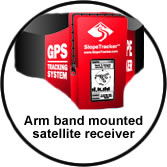 SlopeTracker's GPS Tracking armband is available at resort kiosks or guest services. The small, 3-oz band is worn comfortably on the arm. Pick one up before you start your day on the slopes. The GPS technology automatically records the skier’s resort experience. For an easy-to-understand explanation of how GPS works, check out this "How Stuff Works" article. At the end of your day, you simply return your armband and receive a poster-quality frame-ready printout of your day’s statistics. It’s the illustrated story of your extraordinary day. Memories you can frame and hang on your wall. Feeling particularly proud? Yes, absolutely—we’ll print out extra copies for a small additional fee. One for everyone in your office or dormitory if you’d like. •	Copyright 2002-2010 Pangaea GPS ™, Inc.